Yael buzzed last night and told me about this good news - that she is having a Summer Giveaway on her blog! 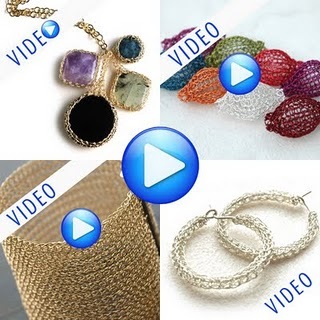 Not only is she giving away her tutorial for free, the tutorial is actually an ONLINE VIDEO TUTORIAL FOR CROCHETED JEWELRY! Ahem!!! Hey!!! You wouldn't want to miss this alright? All you need to do is is take a look at YoolaDesign's etsy shop and her blog here a comment with a link to your favorite item on her shop, please note that your comments are moderated to avoid spam so it takes a while before its out there. Oh my dear, of course I very thanks to you to telling us about this very good news. I like this and will not miss it. Tq dear, mucks! I love her work and would love the tutorial. I am looking forward to visit and read such information further. YoolaDesign makes a lot of good jewelry designs. It is great to know that they are giving away a free tutorial for crocheted jewelry. Thanks!